Wednesday, September 12, 2012 – I am happy to report I still have most of my Hawaiian tropical tan. People keep complimenting me and I am so pleased! I do apologize for not completing this saga of my trip to Hawaii until now. Life has really kept me busy lately. Two press trips, three assignments and so much more! The demands of my life appear to intensify with every day. My last day in Hawaii was July 12. Phil had to work that morning so I caught a ride with him to the airport, arriving at 9:30am. My flight did not leave until 12:30. I stood in the line awaiting check-in for over 45 minutes. Not a soul was at the desk. I told myself not to get frustrated because I fully believe if the airline personnel pick up on any arrogance, then, they will retaliate. Who can blame them? They must deal with difficult, rude passengers, deadlines and much more. I try my best to always be pleasant to them and I smile. When I checked in, I greeted the assistant with kindness and a smile even though I was just a bit tired of standing. She wished me a good flight. Easy enough! I was so sad to leave. Reflecting on my seven days in Honolulu, I must say, this trip has given me a new lease on life. Losing my sweet, precious Prince Marmaduke Shamus in the late spring, so unexpectedly left me empty. For weeks, I could not do anything with the exception of crying. Phil had to practically force me to go to karaoke on Wednesday nights. Gone was the normal smile on my face. Several people asked me what was going on and when I replied that I had lost a close family member, my special beautiful giant schnauzer, I would get strange looks from them. I suppose they have never adopted a rescue animal. Never have I felt so unconditionally loved, but I knew I had to move on, and that was so difficult. The trip to Honolulu refreshed me and on this, the morning I had to leave, I wanted to run away. Maybe I could hide in one of the caves, or on Diamond Head. Maybe I could just climb to the top of a mountain and claim my stakes on the territory. Of course, that was not a realistic thought. If I ran away, just how would I shower, do my hair and makeup and how I would be able to be the real person I am. I suppose I could learn to become a hermit – on top of the mountains of Hawaii, with the beautiful turquoise waters, the refreshing morning rains, and who could resist the smell of plumeria? Humph. Maybe I should stay! Like all things in life, all good things must come to an end. I was thankful I had packed everything the night before. While waiting for my flight, I jotted notes, recalling the culture, the delicious, aromatic scent of plumeria, the gusting fresh air, and wind, the beautiful view of the oceans, and I missed seeing the whales I failed to see, so while scribbling my thoughts I have decided that I simply must come back to Hawaii. I am hopeful Phil will be sent back to Hawaii for work, and I suppose I will just have to buy a ticket, just to keep him company! My last full day in Hawaii I enjoyed the pool again while chatting with strangers nearby. The early morning rain felt delicious on my skin and by 10:00, the sun beamed from the heavens. I relaxed at the pool for a while, then dressed and walked to International Market Place. Much to my surprise, the merchants remembered me and what I was interested in buying. I bartered with one merchant, a tiny Vietnamese woman. She had a gorgeous silver necklace with pearls and matching earrings. When I asked the price she replied, “$250.” I gently placed the necklace aside and walked away. She followed me. “How much you willing to pay,” she said in broken English. “Necklace was only one; a lady from Hawaii made it. I let you have it for better price, if you like.” I’m certain she could see that ‘I liked the necklace.’ In fact, I loved it, but $250 was more than I was willing to pay, even if the gorgeous necklace was one-of-a-kind. I suppose you know, I simply could not resist and I have the gorgeous necklace in my jewelry box. Maybe I’ll wear it tonight! After making my purchase, I walked around the shops, looking around and admiring all the unique items. Gorgeous Hawaiian dresses, with Made in Hawaii tags. Beautiful jewelry that isn’t found anywhere else. I suppose I could continue describing all that I admired, but when you go to Hawaii, you simply must go to International Market Place! Stopping for a cup of coffee, I watched the people, finding them unique. Only once did I notice a young guy with clothing much too big for him, revealing the classic underwear of this style. I wanted to tell him to pull his pants up since they were dragging the ground, but since I was alone, I decided it was in my best interest not to say a word. There are lots of elderly couples walking around, without walkers, canes, or anything to indicate disabilities. I’ve seen one man (yes, according to his body, he was an older guy) wearing a speedo. The garment really did not flatter him at all, even though he had a six-pack abdomen and a nice golden tan. Although he’s athletic, his slow walk, and balding head gives his age away. There is another lady walking around, dressed in a bikini. Let’s just say, she was in her 70’s and did not have the body to wear a bikini. She pushed a cart. Her chest was drooping, almost to her knees and the bikini bottom was just a bit too small for her. I laughed, remembering how I’ve seen some of these people on the beaches of Sullivan’s Island, but this was Hawaii – Paradise! I kept looking at this woman as she carefully sifted through trash receptacles. When she found something interesting, she carefully looked around, as if to see if someone was watching her. When she thought no eyes were upon her, she quickly stashed the garbage items in a Wal-Mart bag. Each time, she nodded, bowed her head, and mumbled thank you. This interesting character still had the grace to be appreciative of the treasures she was finding. I was curious as to what she found, but I didn’t dare inquire. Nor did I take a photograph of her. I suppose it is true, what is junk or trash to someone is a treasure to someone else. Yes, you meet and see all kinds in Hawaii and every place, when you have the time to sit and relax and people watch. I made a note to remember this woman and to use her character in a story. She fascinated me. I was curious as to what had made her this way. Was she homeless? Did no one else care about her? A few moments later, a maintenance worker opened the trash receptacle, to empty it. Only a few pieces of trash did he find. He scratched his head and moved on. I suppose he was curious as to why the container had so little. People are so interesting! Finishing the last sip of coffee, I decide it is time to journey back to the hotel room. Before exiting International Market Place, I throw a kiss to say “Aloha.” Just how long will it be before I shop here again? That’s truly a great question. I truly hate to leave Hawaii. Before going back to the Hyatt Regency Waikiki, I use the cross walk and walk over to Waikiki Beach, to say goodbye, until we meet again. There are several benches along the sidewalk, so I sit down, open my journal, and jot notes. The wind is gusting now as a beach hat flies by me and flops down on my bench. I anticipate someone will claim it, but so far, no one appears to want it. Suppose this could be a great toy for my new giant schnauzer, Prince Midnight Shadow. According to my dog sitter, he really needs to calm down a bit. Silly guy, in July he was so new to our household he didn’t know the rules. When I return home, I’ll start the discipline and training schedule. This hat could be something fun for him to play with since he loves to destroy all the toys! 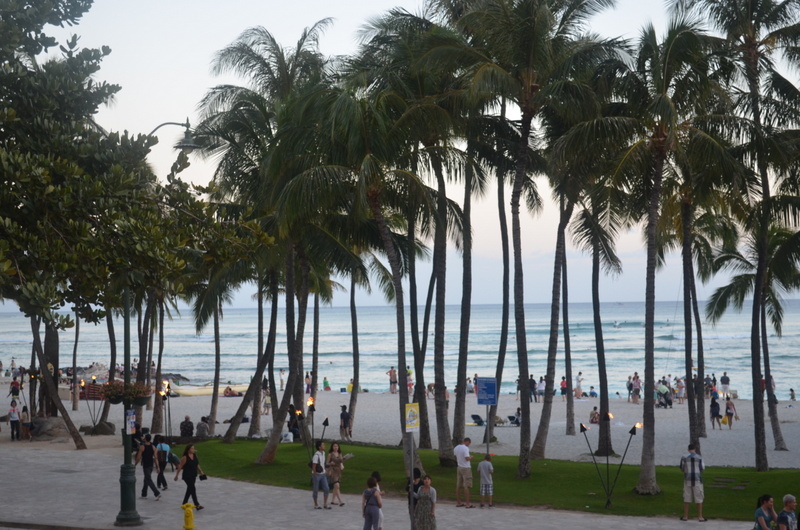 At 5 o’clock, I rush back to Waikiki Beach. The concierge said there was a hula show today. 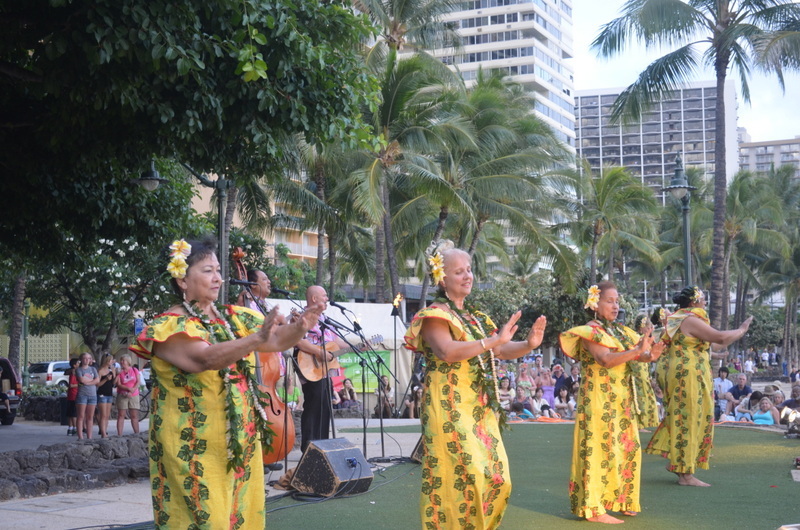 At sunset, the torches are lit, a conch shell is blown, and the hula show begins. Phil arrives and we stand, admiring the great atmosphere and show. I take an abundance of photographs, only to stop when my digital camera smart card is full. Rats. I wanted to take some more. 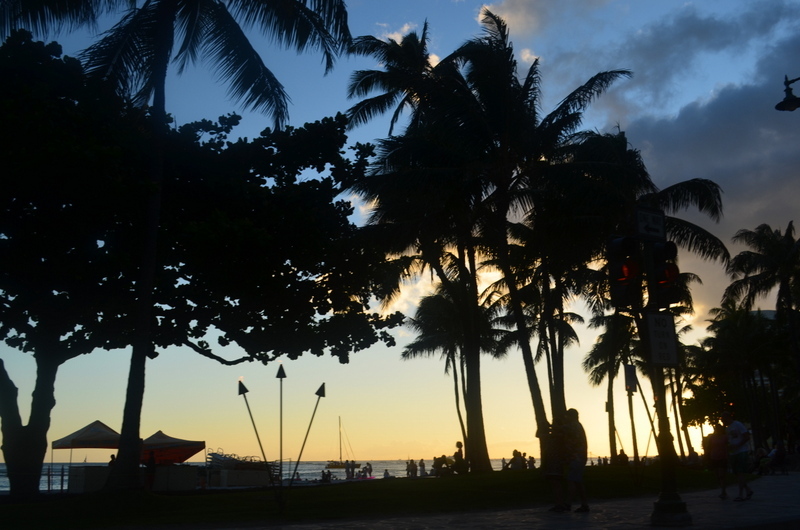 Wouldn’t you know it…my last chance to capture sunset shots of Waikiki Beach and my smart card is full. I have several in my camera bag – in the hotel room. Duh! Today is truly my last day in Honolulu. Tomorrow I’ll board the plane and return home. I truly have enjoyed the culture, music, conch shell chimes, the food and fish, fruit; especially the pineapple slices on iced tea, and the people. Such a fascinating place to fall in love again. Maybe that is what is happening to me here in Hawaii. I am falling in love again – with myself. I’ve noticed that many of the residential homes in Honolulu have solar panels and it is such a beautiful, almost heavenly place. People appear not to rush around on the sidewalks and the lack of cell phones attached to ears truly intrigues me. I do know cell phones work here because I’ve phoned several friends back in the states, just to say, “Aloha!” I must say, some of the most interesting people I’ve met are Hawaiian natives. The native women are small, with dark, exotic looks nice bodies and small chests. The men are well-built – even in middle age they still have the bodies of surfers and their graying hair simply adds to their demeanor. I suppose I could describe many of these men as “good eye candy” as the cliché describes. Don’t think I took any photographs of this eye candy. I saw one stunning ‘older woman’ and I hate that expression. She was one of the performers at the Hula show. Her hair was snow-white. Cheek bones high and her body was still all in the right places. She walked, danced, and moved with graceful beauty. Hawaii has so many tropical trees they appear to touch the skyline. Some of these tropical trees appear to grow sideways, making them interesting tree sculptures. Walking around, I smell the aromatic scent of plumeria. I simply must find a cologne containing plumeria. I will never forget that delicious aroma! 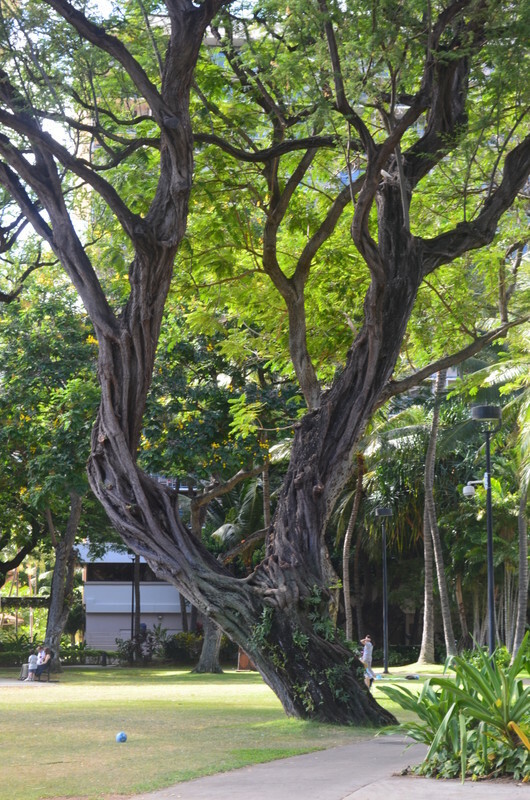 Honolulu and Waikiki Beach is truly a walker’s paradise. I will miss these pleasant walks. Never did I break a sweat. The humidity level is low and with the trade winds blowing, it is so refreshing just to walk around, watch people, shop, and enjoy the view. 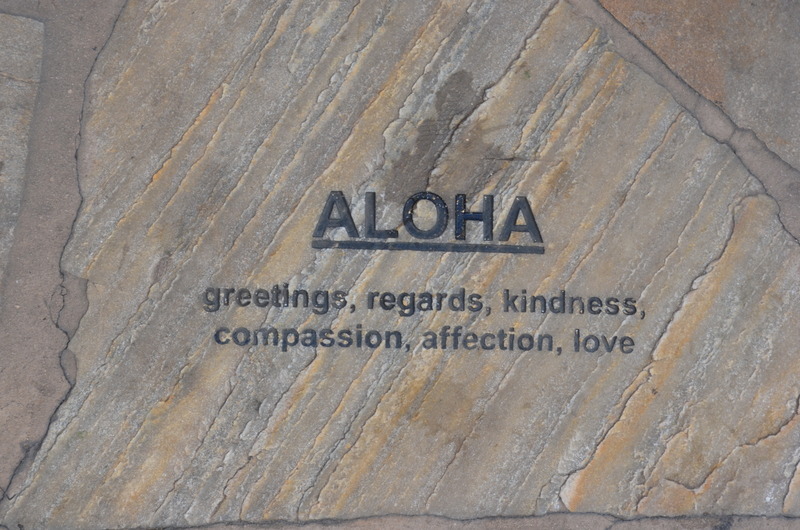 On many occasions when walking, I’ve glanced down at the crosswalks to see definitions of “Aloha” or other Hawaiian words on the sidewalks. What a great idea. Our last night in Hawaii we decided to make it a special night by walking in the downtown area. We had dinner at Seafood Village. I ordered Manchurian Mahi Mahi. It was so delicious. There is something special about the fish in Honolulu – it is so fresh and tender, combined with the fruit salsa and you truly have a delicious, mouth-watering meal. After dinner, we continue walking towards the street vendors and characters. Gosh, there are so many. We passed by a group of people standing around listening to two young boys singing. They were truly drawing a crowd and were most talented. I can’t recall the song they sang, but I do believe it was a Michael Jackson tune. The character I’ve mentioned before, the street vendor dressed and wrapped in newspaper was out. Placed by his foot was a tip jar. Elvis was out again – that is – a Japanese, or Polynesian Elvis. I waited a few minutes to listen to him, but he did not sing. He was more interested in watching the bikini chicks strolling by. I suppose you could say, He was a typical “Girl watcher” Elvis. Not far from him was a mime. I think I could easily love living in Hawaii! On the flight home, tears dripped from my face as I realized my dream week was ending. In less than 24 hours, I would be home, back to reality. The flight home was long, a night flight from Los Angeles. Tip to all frequent flyers – when you are flying and change planes, you will need to reenter the terminal and go through all of the security devices once again. While I understand it is to protect the safety of all passengers, it really does take away from the fun of flying. Trust me, flying isn’t fun anymore! Reluctantly, at LAX I inquire about how I might find United Airlines terminal. A young girl with punk rock hair, nose rings, and an attitude glares at me when I ask her. “Do you think it’s my job to know everything here?” She screams. “Obviously someone has burst your bubble today. Have a great day.” I rush away from her. I continue a journey I’m not certain is taking me anywhere I need to be but I glance up to see an Information Booth. There I am told to exit the building. Take a bus and go to another gate. I follow the suggestions and about fifteen minutes later, I stand at United Airlines. By now, I am so tired I simply want to curl up somewhere and sleep, but I never sleep while traveling. I have to be in control and know what’s going on. The next flight is to Charlotte, NC, scheduled to arrive at 9:15am. On the plane, people settle in to their seats, tucking themselves in for the night flight. Two hours in to the flight and I listen to many people snoring and mumbling in their sleep, but sleep does not come to me. I have a window seat and watch the night display of falling stars, in the distance, I see a stunning show of lightning, but it is so far away I am not frightened. The lady sitting two seats from me is sound asleep now. Behind me, the two soldiers headed home after wars are snoring. I don’t dare ask them to stop. Besides, I cannot sleep. I watch the dark, midnight skyline fade into shades of gray, as the morning sun rises. I reach to get my sunshades. I will arrive home in Charleston at 10:45. I plan to play with the pups and take a nap. I’m exhausted yet so energized while thinking of my dream vacation to Hawaii. 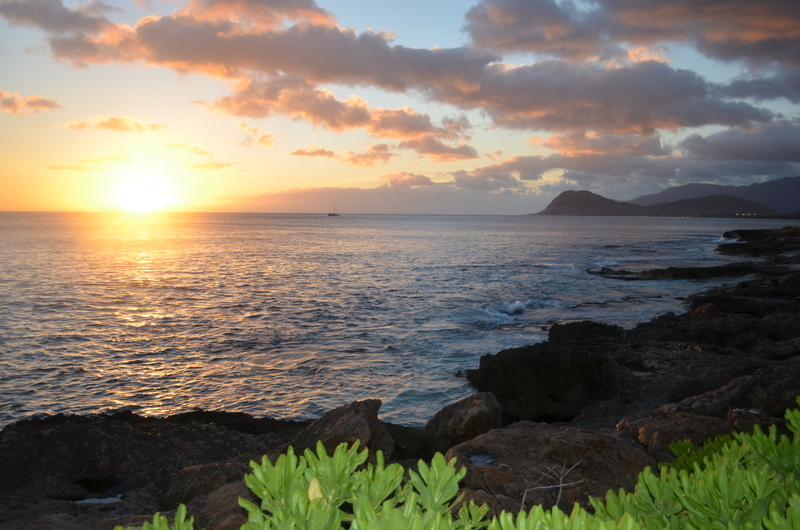 I will miss the morning sunrises and misting showers of delicate rain drops, along with the stunning sunsets of Paradise Cove and Waikiki Beach. I will miss the pleasant people of all lifestyles that I met. The couples celebrating their 50th anniversary. The military. The culture. 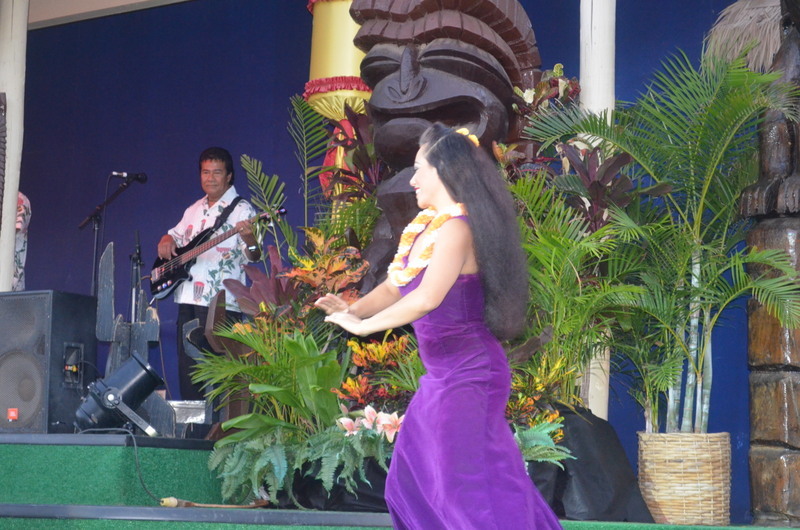 Hula dancers and music. I will miss admiring the gorgeous surfers and men, and believe me, there are many exquisite men in Honolulu. 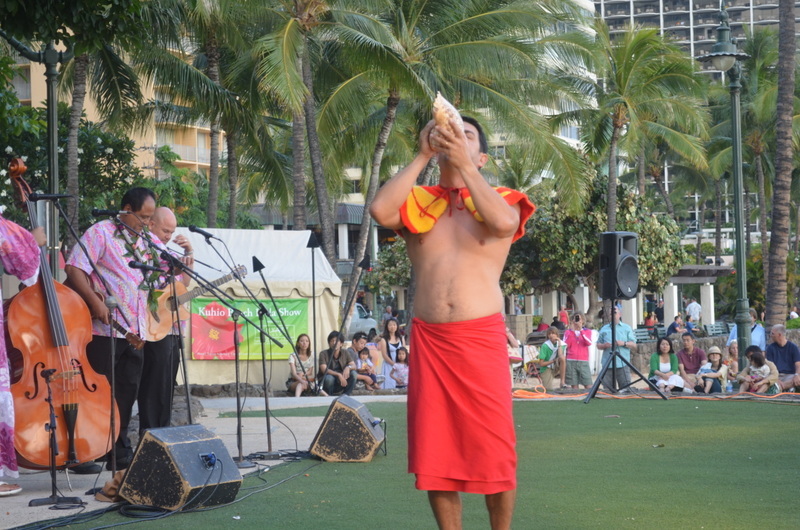 The blowing of the conch shell. Blowing Rock. Diamond Head. The coastal highway and the spectacular views. The sweet-smelling scent of plumeria. Walking along Waikiki Beach. Hula dancing. The culture and language, and so much more. I think I left a piece of my heart and soul in Hawaii, as the trade winds blew, my scent followed, but like all things in life, I must get back to reality. 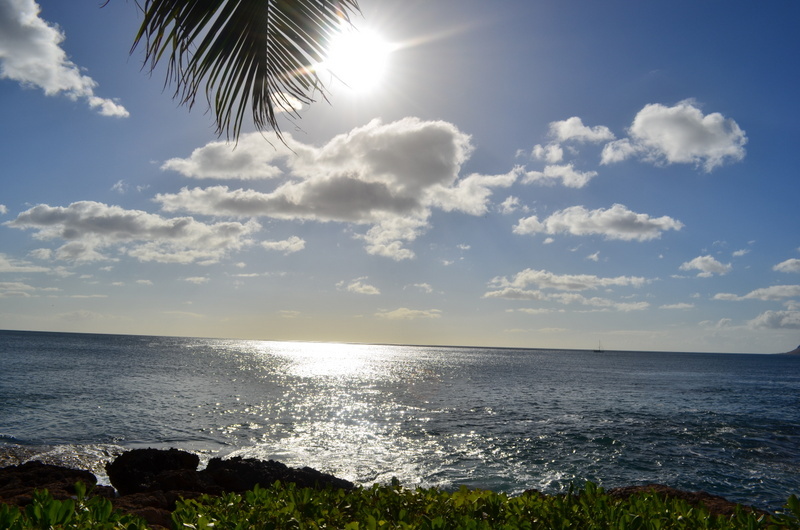 I miss you, Hawaii! For now, “ALOHA” until we meet again!